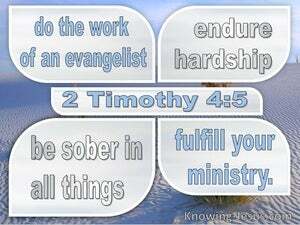 ﻿ 2 Timothy 4:5 But you, be sober in all things, endure hardship, do the work of an evangelist, fulfill your ministry. But you must be clear-headed about everything. Endure suffering. Do the work of an evangelist. Devote yourself completely to your ministry. But be thou sober in all things, endure afflictions, do the work of an evangelist, bring thy ministry to fullness. As for you, be calm and cool and steady, accept and suffer unflinchingly every hardship, do the work of an evangelist, fully perform all the duties of your ministry. But you should be sober-minded about everything, [willing to] endure hardship, do the work of an evangelist, fulfill your ministry. But do you be watchful in all things, endure evil, do the work of an evangelist, fulfill your ministry.? But be self-controlled in all things, do without comfort, go on preaching the good news, completing the work which has been given you to do. be you then entirely upon the watch: be insensible to toil: perform the work of an evangelist, and discharge your ministerial function. But thou, be sober in all things, bear evils, do the work of an evangelist, fill up the full measure of thy ministry. But be thou sober in all things, suffer affliction, do the work of an evangelist, make full proof of thy ministry. But you must always be composed; do not shrink from hardship; do your work as a missionary, and your whole duty as a minister. But watch thou in all things, endure affliction, do the work of an evangelist, fulfil thy ministry. But watch thou in all things, labour, do the work of an evangelist, fulfill thy ministry. And thou be sober in all things, suffer ill treatment, do the work of the bearer of good news, render thy service perfectly certain. But you watch in all things, endure afflictions, do the work of an evangelist, fully carry out your ministry. But you, be self-controlled in all [things], bear hardship patiently, do the work of an evangelist, fulfill your ministry. But watch thou in all things, and suffer adversity, and do the work of an evangelist, fulfil thine office unto the utmost. Whatever happens, be self-possessed, flinch from no suffering, do your work as an evangelist, and discharge all your duties as a minister. But as for you, be always self-controlled, face hardships, do the work of a missionary, discharge all the duties of your ministry. You, however, be self-controlled in all things, endure hardship, do an evangelist's work, fulfill your ministry. But you be sober in all things, suffer hardship, do the work of an evangelist, and fulfill your ministry. But be thou watchful in all things, endure hardship, do the work of an evangelist, fully accomplish thy ministry. But do you be sober in all things, endure evil, do the work of an evangelist, perform fully your ministry. But watch thou in all things, endure hardship, do the work of an evangelist, fully discharge thy ministry. But you, Timothy, must always be temperate. Face hardships; do the work of a Missionary; discharge all the duties of your Office. But as for you, you must exercise habitual self-control, and not live a self-indulgent life, but do the duty of an evangelist and fully discharge the obligations of your office. But you, on your part, must always keep your head cool, suffer hardship, do your work as a herald of the good news, and so fill your ministry to the brim. But be sober in all things, suffer hardship, do the work of an evangelist, fully accomplish your ministry. But be thou watchful in all things, endure hardship, do the work of an evangelist, give full proof of thy ministry. 4 and will turn away their ears from the truth and will turn aside to myths. 5 But you, be sober in all things, endure hardship, do the work of an evangelist, fulfill your ministry. 6 For I am already being poured out as a drink offering, and the time of my departure has come.